Corrigan’s Londis store, Kilmuckridge, County Wexford. 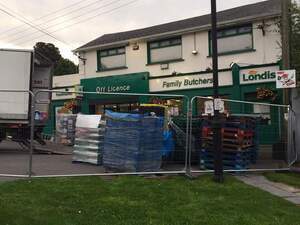 [Security firm] Ktech have taken Corrigan’s shop [in a bank-mandated seizure] this morning, at 5 am, supported by around 50 Gardaí. They knew what they were up against. In fairness. Posted in News and tagged corrigan's, Deloitte, kilmuckridge at 10:08 am on September 21, 2016 by Broadsheet. The owner obviously used the property as security for a loan and then did not keep to the terms of the loan (in what seems to be an extended period of time). The bank went through the proper channels to take ownership of the property. If the business is viable then a new operator will buy it from the receivers and hire people to work there. Hopefully the new operator will have the sense not to borrow money that he can’t repay. Live in servitude and obedience, slaves to usury. That’s a terrible suggestion. Why would we do that? It sounds awful. I’d rather be a slave to the rhythm. Lets see a possession order signed by a judge so. Don’t have one? Never mind the state will use it’s own militia to help the banks circumvent the law. Zuppy this is a receivership therefore you don’t need a signed possession order, but I am sure that doesn’t matter to you either way. Just like the law doesn’t matter to the Guards. Facts really aren’t your thing, are they? So they are enforcing the law here but some how it doesn’t matter to them? yes, obviously that’s what happened.. damnit Sherlock you’ve done it again, and with only this series of images to go on.. your mental capacity is beyond compare..
@Bandy: But in fairness is that not what happens regularly! How many of these eviction orders have been incorrectly executed over the years? In fairness Youtube is full of them, usually with the guards on hand and very often turned away – once the law has been pointed out to them – and they retreat with their tail between their legs. Never confuse authority with intelligence. The ignorance of the general population (who in fairness shouldn’t have to be property law experts and should be able to depend of the police of their own country to uphold those laws) has been played upon very cynically by the vested interests of this nation. That’s not to suggest in any way that what happened this morning was an illegal act, its just that it shouldn’t be assumed – because of the presence of An Garda – that it was a completely legal one. We know this now from vast experience, especially the ineptitude of our own police force, that this may not be the case. I was replying to the original commenter ‘Nikkeboentje’ who said the owner ‘obviously used the property as security for a loan’ but thanks for that anyway. I read the article that was linked in “They knew what they were up against. In fairness.” It clearly states that Deloitte was appointed as receiver by KBC. Can you please explain another reason why you think a bank would appoint a receiver to reprocess a property? They have the village surrounded? The siege of Kilmuckridge? No Surrender! I’m sure I learned the Siege of Kilmuckridge in my old Dancing class. Why do people post these things to broadsheet with out the facts provided. All people can do is have a guess about the situation behind the post. You don’t send the bailiffs in without good reason. The fact the guards are there must mean they are happy with the paper work provided to seize the goods. Or the Guards are happy with their under the table ‘bonus’. The state has been facilitating the banks’ usurping of the law for decades. The law in Ireland in relation to repossession of a property is strongly in favour of the borrower. The bank has to wait years and through a very complicated legal process. If the borrower makes an attempt to repay the loan/interest payments, no matter how small an effort, usually the court will side with the borrower. Or this guy should have just paid his bills and he wouldn’t have found himself in this mess. He signed a contract saying if he broke the terms of a loan agreement then the property would be repossessed. He broke the terms, guess what happened. Bit of a stretch there. Maybe they lived in the store room. Not one but two substantial corrections in that Times article. It’s almost like people up to their eyes in millions of euro worth of debt like to tell an ould porkie to spin a yarn. Well done, inept business owner. Perhaps the banks gave him a loan without doing a proper audit of his worth and ability to pay. Perhaps when one seeks a loan, one should be aware of ones own worth and ability to pay. Perhaps one should also have the precognition (or a time machine) to know when an established and seemingly stable market is about to collapse due to the actions of greedy people far away? 100% Totally everyone elses fault and nothing to do with the poor business owner and their inabilities to pay back the money they borrowed. 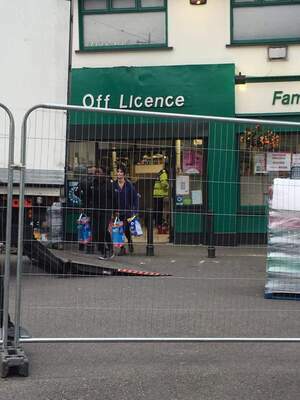 It’s odd how you don’t see this very often, a repossession of a business with employees depending on it. Yet, we have seen it twice with this business. But you’re right. The banks corruption and the market crash just shy of a decade ago are to blame. Fuppin banks man. “Due to the greedy actions of people far away” cry me a river. It’s a rural supermarket, it went bust. I don’t think the Rothschilds had this as part of their major plan. given that photographs were being taken, and given that it was said there is 50 gardai present, why aren’t there more photographs of the gardai? RTE have reported that there are over 40 Gardaí there. The gardaí are going to boycott the TV licence in response to RTÉ’s incorrect reporting of their numbers. do you exist? if so, why haven’t we seen a picture of you? These are the sort of gobsheens that borrowed more than they could chew and the rest of us are still having too pay for. The fiscal feicklessness on the owner led to this. You cannot expect to take a loan, not repay and keep the asset and the leverage. Since when is the government responsible for keeping private enterprise profitable? If it is a bank or a German bondholder, the Irish Government have taken responsibility. True, however does that then mean that every unpaid private debt should be written off or repaid by the government. Many commercial loans are given on 5 year terms. Normal procedure was to pay down a part of the loan over 5 years, and then roll the balance over into a new loan for another 5 years. When the stuff hit the fan, most banks reneged on normal procedure and demanded the cash. This is what busted many shops and hotels over the last 8 years. I’ve no more idea than you guys about this specific case though. Coming in here with your sensible ideas and well thought out informative comments….thanks for that. The guards are keepers of the peace i.e. defenders of the people. they are not a police force, i.e. protectors of the people. This is how they are constituted. If it a choice between defending the law and uphollding government mandate, the guards will always choose the later, as they are required. This is why there is no apetite to pursue white collar crime or government corruption by the guards, this is part of the status quo. This also why the consitution of the republic can be subverted by the government. Uuuuh, where’s the video shot in portrait of some gobby Brit saying this eviction is illegal? I need it for my morning comedic sustenance. Judging from some of their facebook posts, the ‘Anti-Eviction Taskforce’ is connected to Ben Gilroy, former leader of the right wing group Direct Democracy Ireland. Because Prime Time is a great moral compass. Also you might want to look up what “right wing” means. You’re free to do your own research on Gilroy. He’s mental. Rita O’Reilly is an excellent reporter. The report she did on Direct Democracy above is solid reporting, imo. Direct Democracy has described itself in the past as neither “left or right”, but a number of publications/commentators have highlighted DDI’s right wing ideological stance, as well as it’s close links to the right-wing conservative Christian Solidarity Party. I find most people/organisations who describe their political outlook as neither left or right tend be considerably more right than they’re willing to admit. Man asked to repay loan shocker? What’s it got to do with the government? If the owners of the shop paid their debts, then this wouldn’t have happened. Am sure that a proper journalist will go there, obtain the facts and will accurately report the story . RTE reporting over 40 gardai & id checks to get into the village. Bit much alright. just a thought but maybe the “goods” in question aren’t something you might think to find in a Londis. Hence lots of Guards, ID checks etc etc. 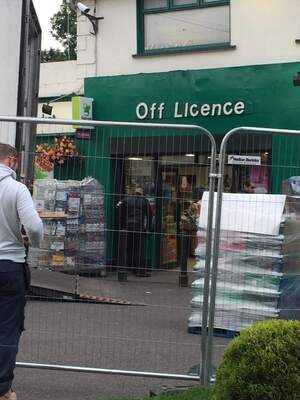 Maybe the owner is “known to Gardai”. allegedly. etc. Bear in mind that if you are paying money to a bank, say a mortgage, you are probably paying 1% more interest than you would have to if there was in place an effective and timely mechanism in this country for the repossession and sale of assets securing non-performing loans. In simple terms, you are paying because they are not. The bottom line is that we don’t know the full of this story. It could be that the loan was, as pointed out by @mourinho, on the normal terms that many businesses secured loans and was due to roll over to a new agreement but the requirement of capital meant the bank put pressure on for repayments etc. Or it could be the owner simply stopped paying their creditors and failed to achieve an agreement for a new period of repayment etc. If it’s a case of a struggling business not being able to pay their loans unfortunately that’s how the free markets work. You can’t pay, well sorry but the loan was secured against the asset and the bank, like it or not, have recourse in seizing the asset. And the court will not just hand out a repossession order for the craic. It’s a pretty lengthy process. Insinuating that the Gardai are taking bribes is insidious though. It’s the same when talking about (whisper it) water charges. 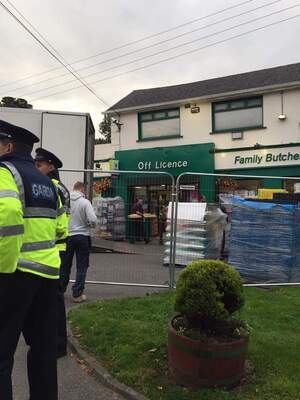 You’d swear the Gardai love the idea of paying for their water or kicking people out of their businesses. They’re human. They have a job and if the paperwork is in order and if the application has been granted then it is their job to ensure that the enforcement goes off peacefully. To imply that they are in some way crooked is beneath contempt. And before I get responses highlighting cases of ‘bent coppers’ – obviously there are those who aren’t what one would want from your police force. But that’s the way of live and you’ll find the same in all walks of life.